Well, howdy from the Ozark hills of Branson, Missouri! I can’t tell you how excited I am that spring is just around the corner! To see bright green leaves on the trees and the dogwood bloomin’ well, it just makes me want to click my heels and shout Hallelujah! 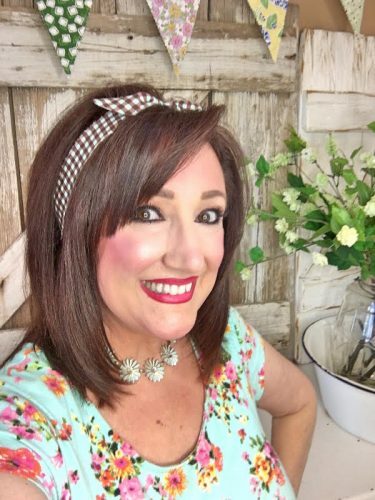 To get a jump start on this glorious season I came up with a super easy way to add some color and delight to my home with a vintage flair! 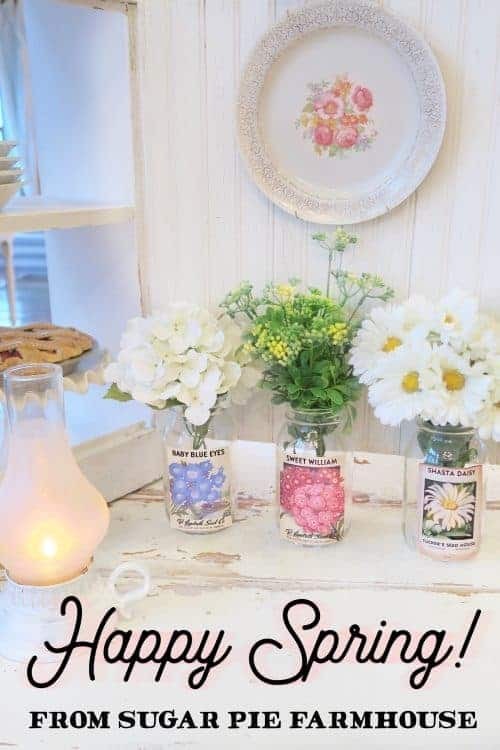 I made labels out of some old-timey seed packet images, glued them on some jars and added some cheery flowers. Hooray for Spring!! 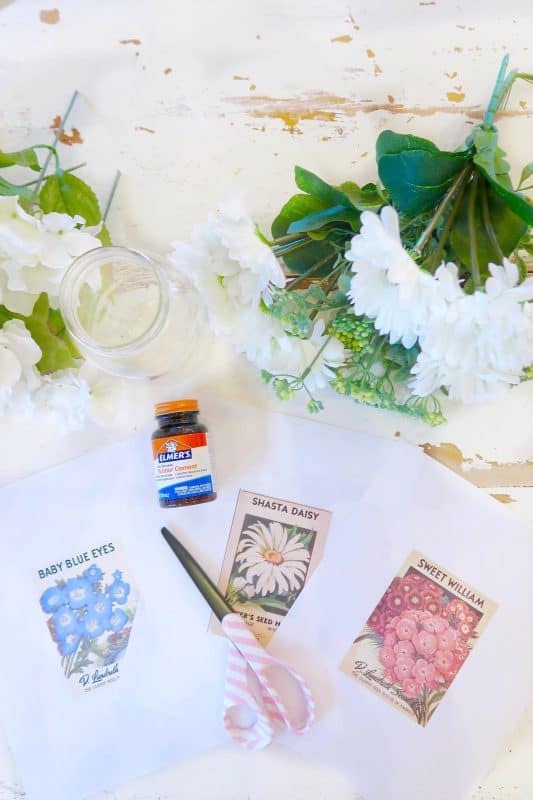 All you need to do is print the seed packet images on the computer, gather some scissors, silk flowers, rubber cement glue and some smooth sided jars (these don’t have embossing on the front so you can adhere a label easily. You can find them at Michaels or Amazon). 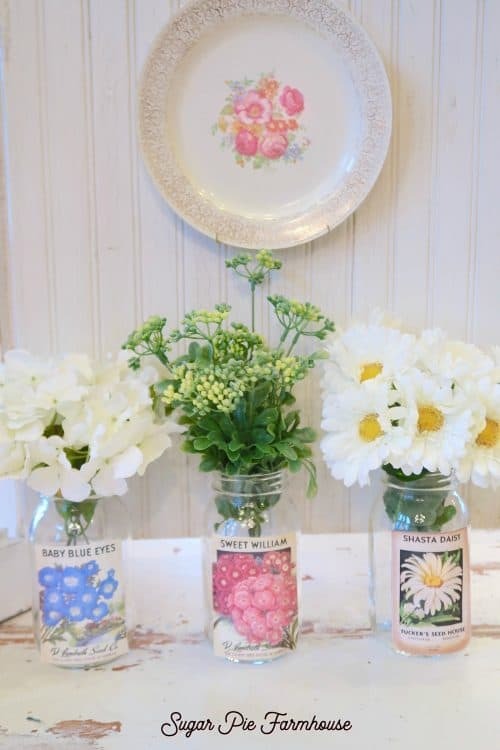 Cut the vintage seed packet images that you’ve printed, and glue them on the front of the jar. I use Elmer’s Rubber Cement glue because when you want to take the label off, you can easily peel it, kind of like a Post-it note…so no soaking the jar to remove the seed packet label…yay! Add some silk flowers and lo and behold you are left with this darling and cheerful Spring Fresh Centerpiece! I got my flowers from Michaels at 40% off. I already had the jar and glue so I made this for about $3.50. This is such an easy way to bring a touch of Spring cheer into your home! 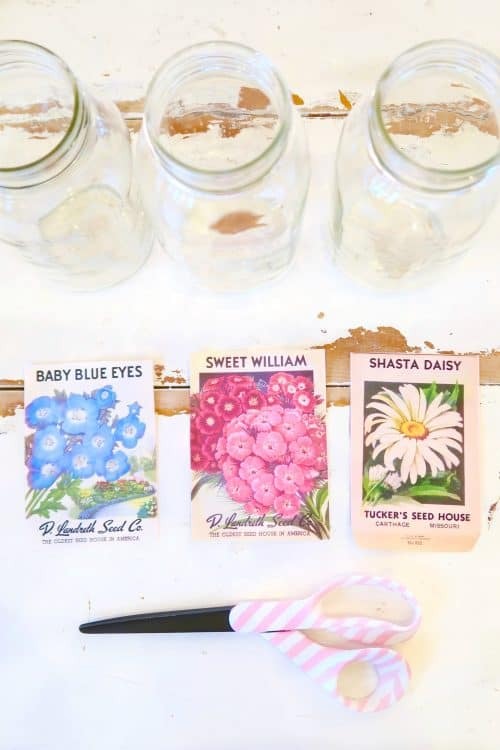 I’ve included the printables for these vintage seed packets just for you! Simply click on any photo below and choose “save” to save it to your computer and then print out. 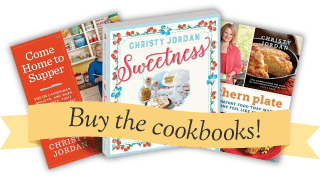 You can also go to Pinterest to find more. Well, I hope this inspires you to celebrate the glories of Springtime! Say howdy in the comment section below! What a cute idea!! Love it. I just love you Ruthie so sweet! I love what you represent. What a spring-sweet idea!!! Thank you so!